"41HS3, 751, Burial A-57" by Timothy K. Perttula and Robert Z. Selden Jr.
DECORATION (INCLUDING MOTIF AND ELEMENTS WHEN APPARENT): The rim panel has a series of four upper and lower horizontal and vertical engraved scrolls. One set of scrolls begins under the vessel lip and has rounded corners, while the other set begins and ends at open triangle elements; at the mid-section of these scrolls is a rectilinear vertical column with a hatched horizontal engraved line. Ripley Engraved, cf. var. Pilgrims or var. 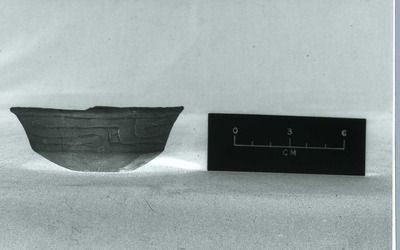 Tiddle carinated bowl (No. 751) in Burial A-57 at the H. R. Taylor site.